An add-in is a collection of ArcGIS Pro customizations that is packaged in a single compressed file (.esriAddInX). 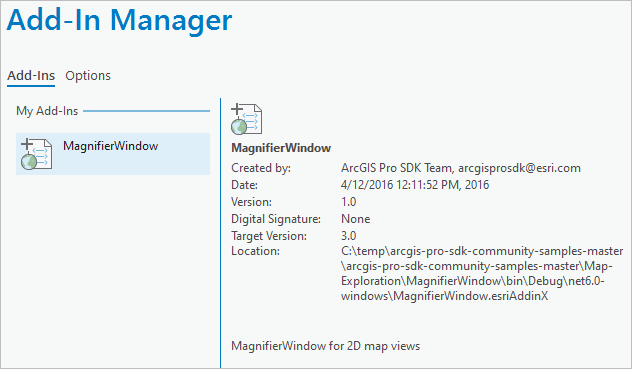 Add-ins are configured and managed in ArcGIS Pro with the Add-In Manager. You can share add-ins easily because they do not require an additional installation program. You can add add-ins to your machine from a shared network location by double-clicking the file in Windows File Explorer or by manually copying the file to a well-known folder. Add-ins can also be shared by email or from a portal. Add-ins are developed with the ArcGIS Pro SDK 2.3 for the Microsoft .NET Framework. Visit the ArcGIS for Developers site to build your first add-in. Before you install an add-in, it must be validated. Validation ensures that the file is copied to the appropriate location and that there are no name conflicts. It also guarantees that an existing version of the add-in is not overwritten by an older version. To begin validation, locate the add-in. You may browse to its location using Windows File Explorer, open it from an email attachment, or download it from a portal. When you double-click an add-in, the Esri ArcGIS Add-In Installation Utility opens automatically. The utility validates the add-in and copies it to the appropriate well-known folder. On the Esri ArcGIS Add-In Installation Utility, you can review the author, description, version, and digital signature information of the add-in before installation. A well-known folder is a location where the Esri ArcGIS Add-in Installation Utility and the Add-In Manager look for add-ins. For more information and customization options, see Add-in Manager options, below. From an open project, click the Project tab on the ribbon. Alternatively, on the ArcGIS Pro start page, click Settings in the lower left corner. In the list on the left, click Add-In Manager. When you open the Add-In Manager page, ArcGIS Pro searches specified well-known folders for add-in files. After the files are located, they are installed and appear on the Add-Ins tab of the Add-In Manager. The Add-Ins tab provides information about available add-ins. The Delete this Add-In option on the Add-Ins tab allows you to delete local add-ins. Deleting an add-in moves the file from its system folder to the system recycle bin. Shared add-ins are listed under Shared Add-ins and cannot be deleted through the Add-In Manager. On the Options tab of the Add-in Manager, you can view your well-known add-in folders and specify additional well-known folders. ArcGIS Pro searches these folders for add-ins each time you start the application. This option is useful if you use a network location to share add-ins within your organization. On the Options tab, you can also set security options for loading add-ins. These settings will be applied to all folders where ArcGIS Pro searches for add-ins. The default is Load all Add-Ins without restriction (Least Secure). 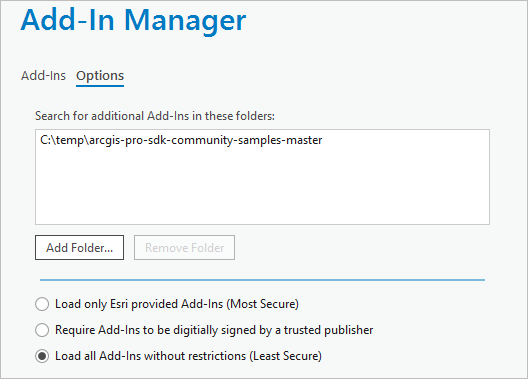 You can choose to require add-ins to be digitally signed by a trusted publisher or load only Esri-provided add-ins (this is the most secure option). Add-ins extend ArcGIS Pro with custom code. This creates a risk that the application may behave in unexpected ways or stop working. As a troubleshooting step, you can temporarily disable all add-ins by running ArcGIS Pro from the Windows command prompt with a special parameter. If a problem is resolved when add-ins are disabled, it indicates that the problem is caused by an add-in located in a well-known folder on your machine or on a shared network.